Don’t you just love it whenever a horror novel lives up to its promise? No joke, I actually had to stop reading this book at night because it was getting too disturbing and creepy for me, and you know I’m not one to scare easily. If this is what I’ve been missing out on for so many years, I wish to hell I’d started reading Ania Ahlborn much sooner. In the small town of Deer Valley, Oregon lives a ten-year-old boy named Stevie Clark. Ostracized by the other kids at school because of his speech impediment and the missing fingers on one of his hands, Stevie has no friends except for his neighbor and cousin Jude Brighton. Whether it’s watching true crime shows on TV or building a secret fort out in the woods, the two of them do everything together and have been inseparable for years. Then one day, Jude goes missing. The entire town mobilizes to try to find the boy, but after his bloody sweatshirt is found, the whole mood of Deer Valley seems to shift. To Stevie’s frustration, no one seems to think they’ll find his cousin alive anymore. After all, the search has already been going on for three days with no luck, and the locals all know the story about Max Larsen, another boy who met a gruesome end in these woods years ago, after disappearing under similar circumstances. That story doesn’t get talked about much though, not unlike the reports going back for years about the dogs and cats that go missing from their owners’ yards. There’s a good reason why there are no veterinarians in Deer Valley. Last year I read and was a little disappointed by the book Disappearance at Devil’s Rock by Paul Tremblay, another horror novel with “a boy goes missing in the woods” main plot. Somehow I can’t help but think The Devil Crept In is what that story should have been. Ahlborn’s take on the premise is the real deal, the way a true horror of psychological thrills and supernatural suspense should have played out. It is a creepy tale worthy of the campfire, containing all the right ingredients: a small town with a big secret, a terrifying local legend that holds more truth than meets the eye, and a young innocent boy that no one takes seriously because of his disability. Of course, it wasn’t all smooth sailing from the start; like any good scary story, this one required a bit of setup. I would describe The Devil Crept In as a novel of three parts. Ahlborn uses the first to establish our main character, a boy who lives a troubled life. Stevie’s father walked out on his family when he was younger, and his mom remarried an abusive man who beats him while she looks the other way. Stevie also often feels frustration at his own speech disorder, unable to get his thoughts across without losing control of his words. He is the target of the worst bullying because of it, not only by the other kids but by his own older brother and some adults as well. So you can imagine how horrible it is for a someone like Stevie to lose his only friend, which means too that the entire first part of this book is taken up by his obsession with finding Jude, with the dogged determination you would expect from a ten-year-old. In my opinion, the introduction was a little too drawn out, with Stevie’s chapters becoming repetitive after a while. Fortunately, that was probably the only point where I felt this book faltered. Ahlborn follows up with a second part that brings about the full-on creeps. The transition was a little jarring at first, as the narrative veers off into a completely different direction, starting over with a seemingly unrelated tale about a woman named Rosie. I’m not going to talk too much about her, as that would spoil the story; all I’ll say is that I quickly became riveted by the horrifying details of her tragic, disturbing life—like witnessing a bloody car wreck where you just can’t tear your eyes away. It might take some time for this part to make sense with the rest of the novel, but once it clicks into place, you’ll see how it all the pieces fit the big picture. The third and final part of The Devil Crept In is where all this magic happens, as elements from Jude’s disappearance and Rosie’s tale begin to gradually come together. The results are eerily satisfying and really hit the spot. Note to self: no trips out to the woods anytime soon. For a straight-up entertaining and chill-you-t0-your-bones good read, I really can’t recommend this book enough. 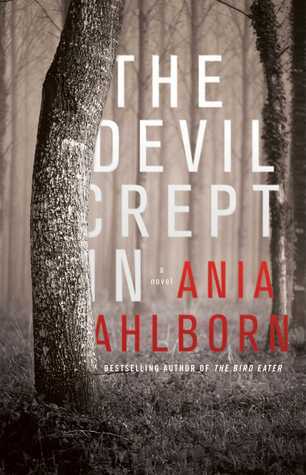 Mark my words, The Devil Crept In might be my first novel by Ania Ahlborn, but it certainly won’t be my last. This sounds really interesting! I barely ever read horror books, so it’s a genre I really want to give a go soon. Maybe this should be the one to get me started on it! I don’t handle horror real well and just reading your review was enough for me. I have The Shuddering by this author on my tbr and hope to get to it next month. My issue with modern horror is how slow it is to get into the actual plot and I’m a bit worried that this might be the same. I think I need something with a bit more action! Sounds like something a horror lover like myself will really like. I’ve grabbed a couple of books of hers for my Kindle because it seems like a few months ago, Amazon kept running specials on them which I couldn’t pass up. I need to keep my eyes open for those deals! I hope they hold those specials again, because I’d definitely snag a bunch! This caught my eye a few months ago. It’s interesting that you compared it to Disappearance at Devil’s Rock, which I was also disappointed in. Sounds like I need to read this, if it was too scary for you! Yeah, this was more what I had in mind when I read Disappearance at Devil’s Rock. I loved Tremblay’s A Head Full of Ghosts, but DaDR was just not as good! OK, I need to read this one. You do! I recommend it to all horror fans. You may make me a horror reader yet, Mogsy. But I think I’d better start with something less scary first XD Great review!